We have special guests here all week for you to enjoy while I am out Stampeding!! Nothing like a big bowl of beans to get a cowboys heart going and Veronica from My Catholic Kitchen has brought over this big beautiful bowl of Baked Beans. Make Veronica feel welcome and come along and follow her on Facebook, Twitter and Pinterest!! She has a gorgeous site with loads of great recipes and beautiful pictures you will love it. ENJOY!! Hello everyone, my name is Veronica Gantley from My Catholic Kitchen. I am so happy to be here today. I love to guest post and when Tara asked for help on our Facebook group I jumped in. Tara and I go way back to the Foodbuzz days. She is a wonderful warm person and I absolutely love her blog. She is doing this stampede theme, you know, Rodeo food, barbecue and stuff like that. So when she mentioned her stampede theme, the first thing that came to my mind was the song Home on the Range, you know, where the deer and the antelope play? It reminded me of Cowboys sitting around a campfire eating beans. Sort of like in those old western movies. 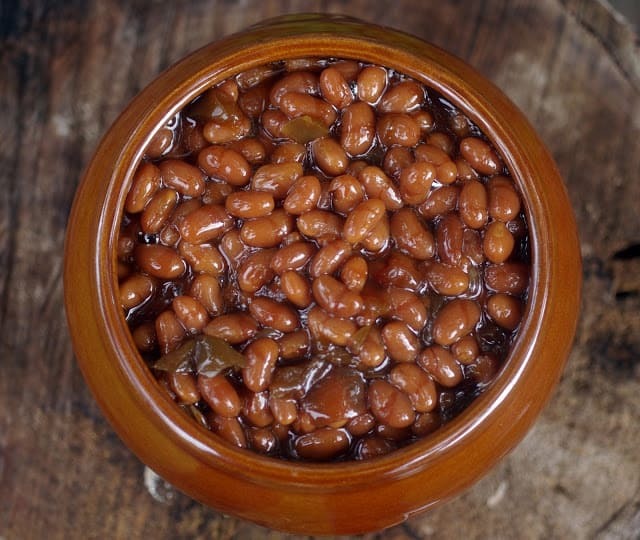 This recipe for Baked Beans comes from my Chuck wagon to yours, Yeehaw! Nothing like a great pot of beans for Stampeding!! Mix the mustard, ketchup, onion, bell pepper, brown sugar in a large bowl. Add the beans and stir gently to mix the mixture. Pour into a 9 x 13 baking pan. Lay the bacon strips across the top. Cover with aluminum foil and bake for 45 minutes. Remove the foil and bake for another 15 minutes or until bubbly. Welcome Christiane!! Those are gorgeous looking beans aren’t they!! It doesn’t get more cowboy than these delicious baked beans, that’s for sure. I love that bean pot, Vonnie! And, Tara, I hope you are kicking your heels up high! I am tired but happily continuing on!! First set of visitors left this morning and the second set arrive this afternoon!! Thanks for coming by Stacy!! Thank you Tara for allowing me to guest post. It was a blast! Those are some gorgeous looking beans, I agree!! 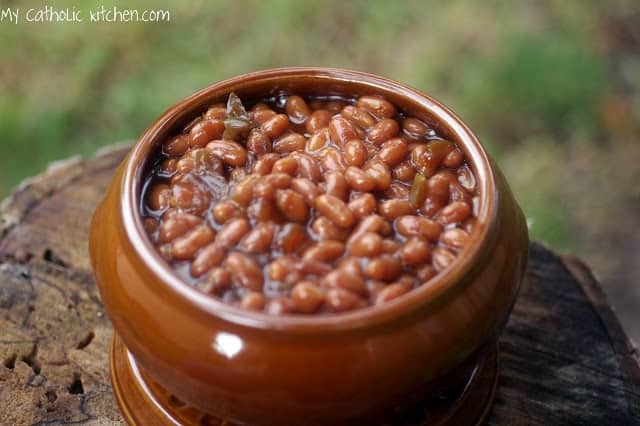 I just dig a great baked bean recipe and this one fits the bill. Going on my must try list. Those are some beautiful bean pictures, thanks so much for coming over Kim!! You have ketchup listed but in the ingredients it does not list it. how much are we suppose to use??????????????????? Hey Janice, so sorry about that. I guess we all missed that. I have asked Veronica and will get back to you as soon as I know the answer. So sorry Janice, it is a 1/4 cup and I have added it into the recipe.